With no fewer than five grand reception rooms the castle offers unrivaled choice to a couple searching for their ideal castle wedding venue. You can arrange to have a Church of Scotland, Humanist or Civil ceremony at the castle and there are also many pretty, local churches. The ballroom is light and spacious and seating up to 80 guests comfortably it is ideal for a romantic ceremony. 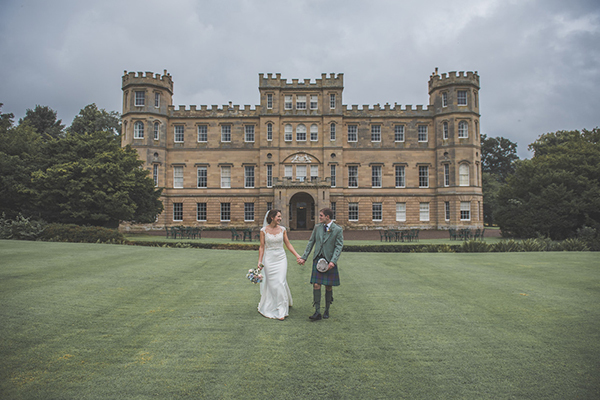 For a more intimate ceremony with fewer guests, couples have the choice of the elegant drawing room or the splendid stair hall with its striking horseshoe shaped staircase – also a super location for photography. There is also the option to hold outdoor ceremonies and drinks receptions, weather permitting! This is an outstanding venue with lots of space for guests in magnificent historic surroundings and in cottages in the grounds. The castle has been host to weddings and parties for over 25 years and the experienced team are on hand to guide you through all the planning and requirements for your big day. With plenty of accommodation on site and excellent transport links to the A1 Edinburgh and Newcastle and trains to London from nearby Berwick upon Tweed, Wedderburn has it all.